The residential building on Maria-Tusch-Strasse comprises 213 subsidised rental apartments in six complexes with a total floorspace of some 16,000 square metres. Commercial floorspace is located on the ground floor and beneath the commercial space two levels of underground car parking have been constructed. What is special about this building is that its façade is made of timber. 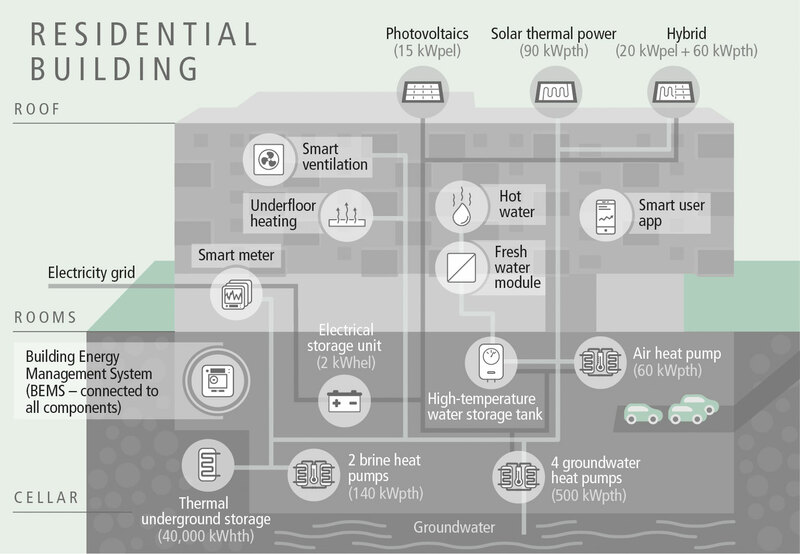 Energy is produced using solar thermal panels, photovoltaic panels and hybrid systems (mix of photovoltaic and solar thermal systems), as well as heat pumps. Interaction with residents in this building is of particular interest to ASCR. 111 households decided to actively participate in the research project. They are able to monitor and actively manage their energy consumption by means of a smart home control app developed in-house. ASCR was also able to harness the waste heat from the car park to produce hot water and heating using an air heating pump. Additionally, a new concept of thermal underground storage was successfully installed.